There is a debate in our family about what a deviled egg should taste like. Who knew that deviled eggs were such a divisive food? So the question is; tangy with mustard or sweet with sugar? 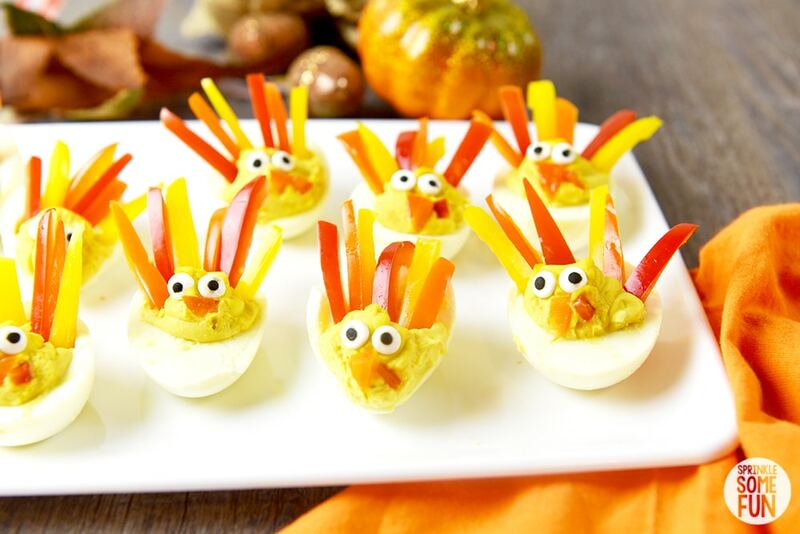 No matter which recipe of deviled eggs you prefer, these cute Turkey Deviled Eggs are sure to be a hit at any Thanksgiving dinner. Deviled Eggs are just one of those things that have to make an appearance at nearly every family function. My Aunt Kathy’s version always gets rave reviews and she insists that it must be made with Miracle Whip and sugar. So if you grew up in my family then you would be used to the sweeter version like she makes. My husband’s family does things a little differently. They make them with mayonnaise and mustard. It’s definitely not as sweet as what I am used to, but they are still delicious. In recent years I have blended the two kinds together and added barbecue sauce for a unique version that I love. I think we can all agree that deviled eggs are delicious no matter what. 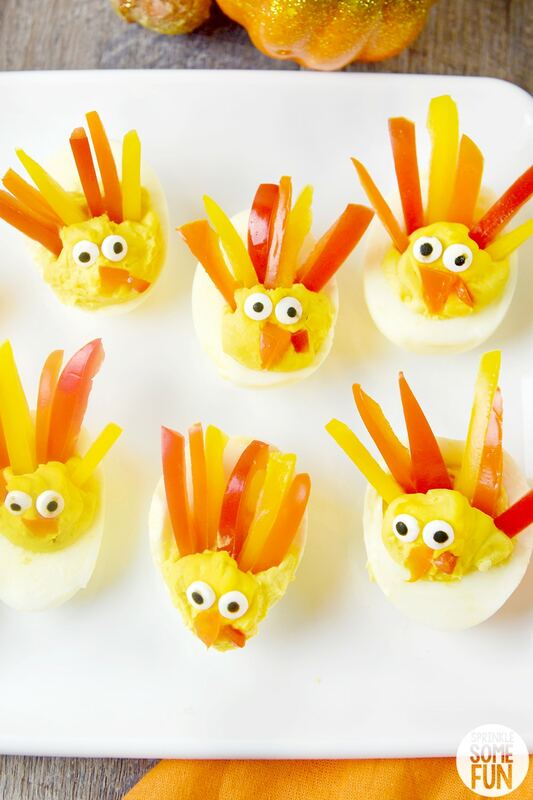 These Deviled Egg Turkeys are a cute way to dress up your favorite deviled egg recipe for Thanksgiving! I love how these cute turkeys turned out! I found the inspiration to make these from Couponing for 4 and knew that I wanted to make something similar this Thanksgiving. 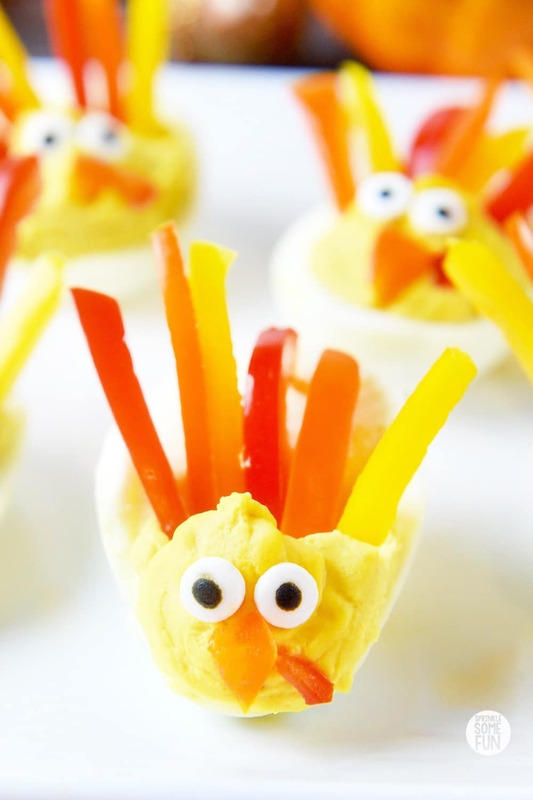 These would also be super cute for a kids table too or maybe even just a snack for the kids! 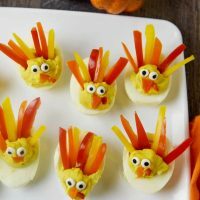 I know in our family we don’t wait until Thanksgiving to make cute Turkey themed treats and snacks. If you want to skip my helpful tips and suggestions to get straight to the recipe; just scroll to the bottom of the page for the recipe. There is a printing option for the recipe too. These really are so simple to make. Just cut small strips of red, orange and yellow bell peppers for the feathers. Then use a long triangle for the beak and another small piece for the wattle. I used Wilton candy eyes for the eyes and that was it! You can find the Wilton mini candy eyes at most craft stores or even Walmart now! You can also find the candy eyes on Amazon too (affiliate link). My suggestion is to use large bell peppers rather than the smaller bite sized variety. The smaller bell peppers are more rounded and harder to cut into long strips. Use the larger bell peppers for the best results. These are cut around 1 1/2 inches long which is the maximum length before they started falling over. You could cut them even smaller and they would look just as cute. It’s important to completely fill the egg cavities with the egg mixture until they are just over the tops of the egg whites. Once you start placing the bell peppers inside the mixture will overflow a little bit and so try not to put too much filling in to prevent them from falling apart. If you have an instant pot I highly suggest making the deviled eggs in the instant pot. They are always so much easier to peel making them in the instant pot even with newer eggs! I used to hate making deviled eggs, but now it’s so easy to peel them because of the Instant Pot. Get the Instant Pot on Amazon (affiliate). There are so many recipes you can make quickly with it! I highly recommend it. Turkey Deviled Eggs won’t store real well for more than 2 hours. You can make the eggs ahead of time and have everything cut and ready to place in the eggs ahead of time, though. The assembly is easy to do in around 15 minutes so just give yourself enough time to put it all together before serving. The recipe I used for these is my favorite and it tasted great with the bell peppers! Here is the recipe below if you want to make it! This recipe for deviled eggs is both tangy and sweet! It’s a must try! What is your favorite deviled egg recipe? 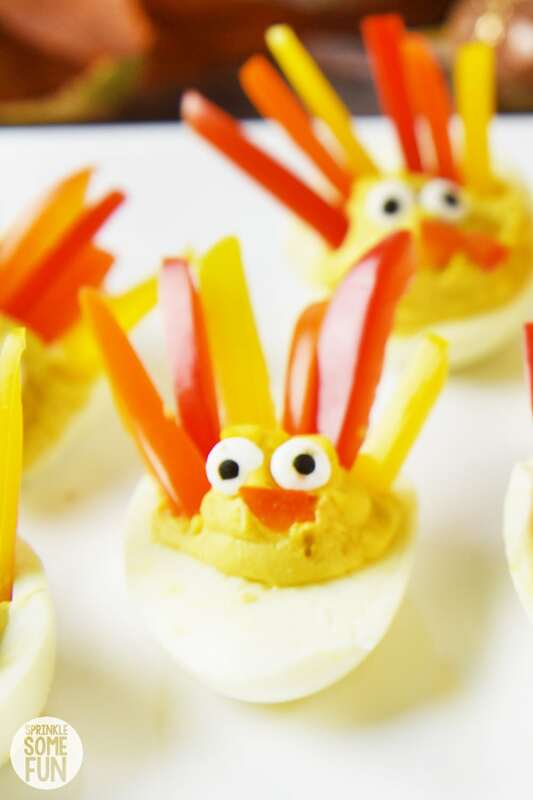 Will you be making these Deviled Egg Turkeys this Thanksgiving? If you LOVE this easy recipe please give us a five star review below! 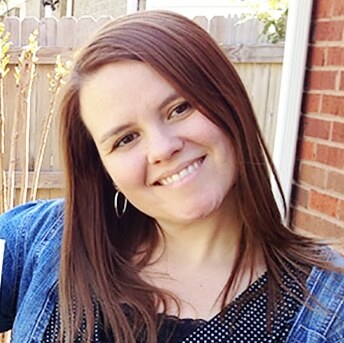 Be sure to share it on Instagram if you make it and tag me #sprinklesomefun so I can see it! Split the eggs in half and take out the yolks and place them into a medium sized bowl. Mash them with a fork until smooth. Then add the mayo or miracle whip , bbq sauce and mustard until mixed and smooth. Place mixture into a piping bag. Pipe into the holes of the split eggs. decorate with the peppers and candy eyes. Serve immediately. The mixture can be store for up to one day, but the decorations are best when made at the maximum of 2 hours ahead.